Little ones rest their heads on a Jurassic scene specially colored by them. What you didn't know about T-Rex is that his real dream was to be an artist, but his arms were too short to reach the canvas. Bring a bit of whimsical, prehistoric charm to bedtime with this DIY pillowcase. 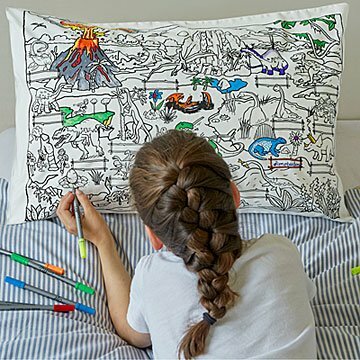 Like a coloring book turned headrest, your little one can color the Jurassic scene one way, then, after running it through the wash, try another playful variation. Soon enough, they'll drift off to dreamland with their pals velociraptor and brachiosaurus. Pillowcase made in Turkey, markers made in China. Includes 10 washable fabric pens. Loved this for a gift idea for a 9 year old dinosaur lover! I have mixed feelings about the markers being washable (gift recipient was a bit upset that his hard work was going to be erased). Other than that, it's a great and unique gift. My great nephew was thrilled with this gift. My son loves this pillow case! He is 6 and loves dinosaurs. It takes a while to color so it keeps him occupied. The markers reportedly wash out after you was it. We haven't washed it yet so we'll see. Come - Also, the markers seem to already be drying out. (And there were two pink markers included, which to a 6 year old, isn't a bonus.) No red marker. Other than that, he really loves it! Now to find the names of all the dinosaurs!